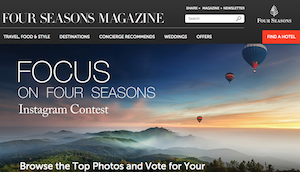 After a 2014 contest where we highlighted great blogs such as Qosy and Holy Smithereens, it’s now time to introduce our 2015 best travel blogs selection with big names and hidden jewels. 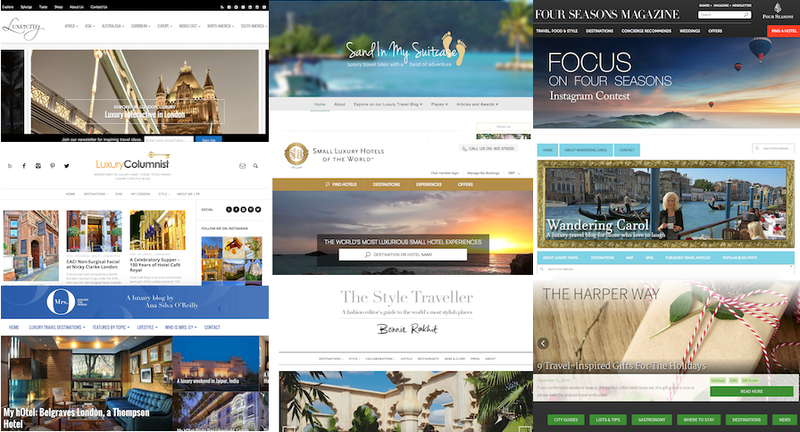 This is a selection of best travel blogs we followed in 2015 ; each of them reflects a certain vision of luxury with interesting contents about finest destinations and hotels worldwide. As usually, I am always open-mind so do not hesitate to use the Contact page to submit comment and/or blog recommendation. 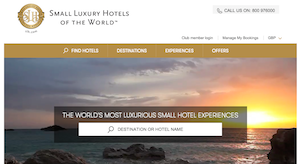 Small Luxury Hotels of the World™ (SLH) is an unsurpassed collection of over 520 hotels spanning more than 70 countries, which together offer an infinite variety of experiences each with its own unique character and charm. Its luxury travel blog highlights the latest news from SLH and share the brand’s passion for small luxury hotels, which are tucked away in some of the most amazing places in the world. This blog is a fashion editor’s insider guide to some of the world’s coolest hang outs and great places to shop, eat, sleep, drink and party when on your travels. It’s filled with tips and advice on what to wear when you’re there, what to pack and a secret address book of the best places to shop when you reach your destination, from urban shopping areas to beachside flea markets. 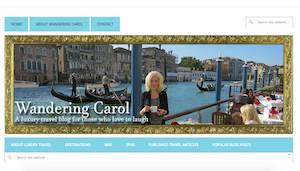 Wandering Carol is Carol Perehudoff, a freelance writer and luxury travel blogger based in Toronto. 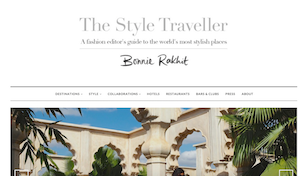 Life as a travel writer takes you to some spectacular places ; in Carol’s career as a travel columnist, spa expert, freelance writer and luxury travel blogger she’s visited some of the world’s best hotels, top spas and most authentic out-of-the-way places. 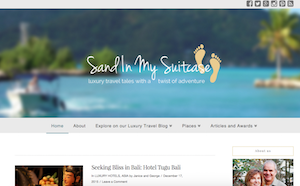 Suze, aka, Luxury Columnist, I started this luxury lifestyle and travel blog on her friends’ recommendations, to share her amazing experiences and love of photography ; her mission is to help everyone experience a little luxury in their lives. 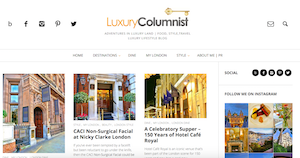 Luxury Columnist was recently named one of the top 10 luxury blogs by Vuelio (formerly Cision) and one of the 50 best luxury blogs and websites by Qosy. Janice and George Mucalov write about luxury travel with a twist of adventure. That includes luscious five-star hotels but also more affordable boutique inns oozing charm and character. Venturing off-the-beaten-path. You’ll find them hiking, kayaking, bicycling, scuba diving and walking city streets from end to end. 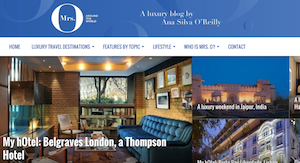 Mrs. O Around The World is a dense blog with plenty of information about luxury destinations and hotels, all personally visited by the author “Mrs. O”, Ana Silva O’Reilly. It has been shortlisted numerous times as one of key luxury travel bloggers and honestly, it deserves it. LuxeInACity is a luxury travel blog curated to inspire the fire in your traveling soul, crafted by real travelers who adore experiencing the best our globe has to offer. From sleeping in boutique bliss beneath the skies of the Aurora Borealis to diving into the deep blue waters of Southern Australia, they don’t just write travel, they live and breathe it in bespoke fashion. 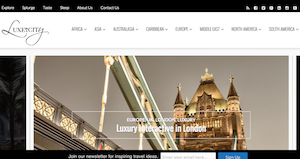 Andrew Harper is a full-service luxury travel company that produces the most respected publication in the business, The Hideaway Report, and provides personalized travel-planning assistance, bespoke tours and valuable travel privileges to its subscribers. 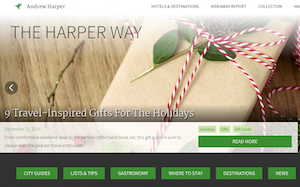 The Harper Way is the blogging part of his activity, describing luxury destinations, lifestyle and tips.